Oh the joys of having boys!!! Here is the FUN part of our day!!! Zach has gotten really good in a very short time!!! Time for a tournament!!! Josh loves the tramp! Backflip 180!!! Makenzie thought the skateboarders were so funny! Every time they would come up on or over the lip of the bowl she would laugh SOOO hard!!! It was even better if they fell!! Feeding has been, other then the obvious motor and speech problem, the biggest issue since her accident! She threw up almost every feed for almost a year! She was 19lbs for almost and year and considered failure to thrive for almost a year. I spent that year trying EVERY formula on the market, making my own formula, shopping at Whole Foods(otherwise known as Whole Paycheck or maybe even Whole Economy), blending foods, getting her tested for allergies and delayed food sensitivities, trying every pump dose and rate within the realm of possibility, talking to GI, homeopathic, DAN doctors, chiropractors, giving her digestive enzymes, vitamin supplements, calorie supplements, thickening her formula, down to the last step which was contacting a biochemist to try to formulate a formula just for her. Then one day while researching new ways to help my daughter I ran across the GJ tube. Had I found the answer? YES!!! No surgery, straight to her intestine, no more puke! The journey wasn't over. It still took another almost year to get her to a rate that would leave her pump free for most of the day. We started very very slow and titrated the rate up. We made it to 50cc and hour. This still left her on the pump for over 18 hours a day. On the way to 55cc per hour we hit a road bump and ended up in the Hospital with Makenzie in tons of pain from her newly placed tube and vomiting. Even though it was bile and not formula it was not great! Long story short Makenzie spent 4 days inpatient. I turned down 4 drugs that we had already tried, started a treatment of bactroban for the soreness, got accused of starving my daughter, and left the hospital at the rate of 50cc an hour! After more research and chatting with moms on a message board I frequent, I found my next answer. This was to double Makenzie's acid reflux medicine. Within two weeks we had her from 50 to 70cc's and hour and 2 weeks later to 80! Makenzie gained 6 lbs that month and her GI put her on a DIET!!!!!! The last 6 months of my life have been great! FINALLY!!!!! Makenzie eats for 10 hours at night and 1.5 hours during the day! She rarely throws up and has been gaining weight! We are leaving for NAPA center in 1 month and need EXTRA pounds and a good feeding schedule as we will need to be off the pump for at least 7 hours a day!!!! PLEASE PLEASE PRAY!!! 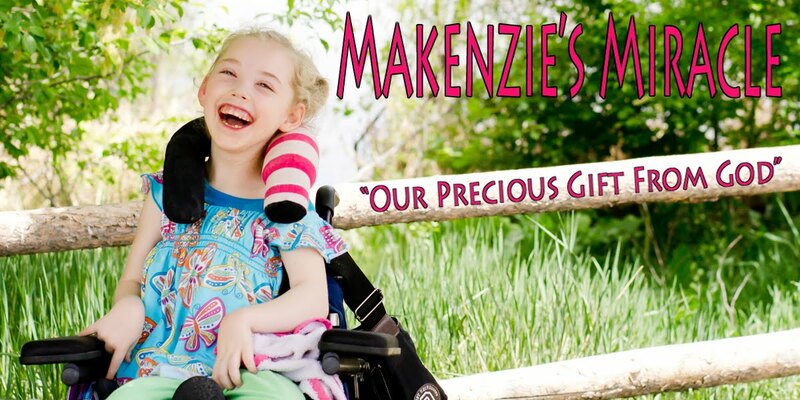 Makenzie's journey is FAR from over! She needs your prayers and support just as much today and in the future as she did on March 25th 2007! Please keep praying! Believe... Prayer Works!!! I know it's a setback but she's come so far! I'm sure she'll get through it and you will, too! I believe in her! And I'm so excited for you guys going to Napa! Hi, I'm a friend of Shauna's and saw the link to your blog. She may need an increase in meds again. As they gain weight, the meds generally need to be increased. I don't know if you've already looked into doing this though. She's come so far! She's doing amazing! You're an amazing mother for doing such a great job doing everything in your power to help her heal!